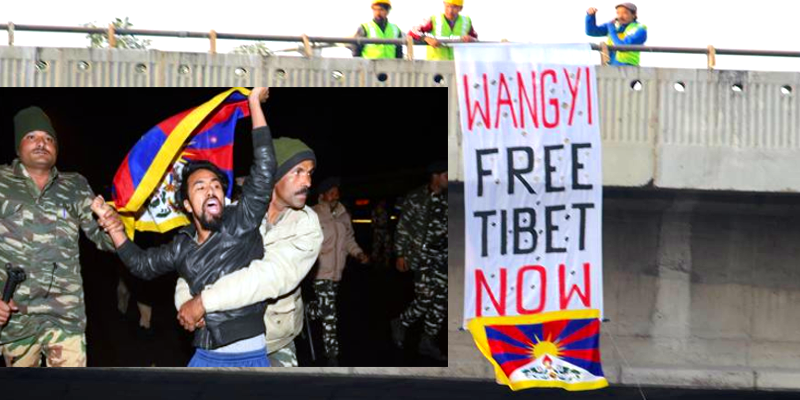 (TibetanReview.net, Dec12, 2017) – Tibet activists greeted Chinese Foreign Minister Wang Yi with a protest banner they hung over a flyover overlooking the road taken by his motorcade as he emerged from New Delhi’s Indira Gandhi International Airport on Dec 10 for his meeting with Indian and Russian counterparts. A protest rally was also held near the meeting’s venue. “Wang Yi, Free Tibet Now”, read the 10ft by 4ft banner, which was put up by Students for a Free Tibet, India. Also, activists from the Tibetan Youth Congress, numbering around 50, held a protest rally in front of India Gate, located near Jawaharlal Nehru Bhavan where the 15th foreign ministerial meeting of Russia-India-China trilateral grouping (RIC) was to be held on Dec 11. The activists, carrying Tibetan national flags and banners, shouted slogans, demanding ‘Xi Jinping Free Tibet’, ‘End Occupation’ and ‘Free Media in Tibet’ among others. The three leaders are expected to discuss security and trade issues in the region and elsewhere. The 15th meeting of the Russia-India-China (RIC) group is also likely to discuss Afghanistan, the Middle East, and the Korean Peninsula, reported rferl.org Dec 11. Apart from the trilateral talks, the Russian and Chinese foreign ministers are expected to hold separate bilateral talks with India’s External Affairs Minister Sushma Swaraj and Chinese Foreign Minister Wang Yi. The RIC session was originally scheduled for April, but China did not confirm Wang’s attendance, obviously due to Beijing’s displeasure over a visit by the Dalai Lama, the Tibetan spiritual leader, to the state of Arunachal Pradesh in northeast India.